My testimony before the City Council hearings today; a pdf of this testimony is here. Thank you, Chair Dromm and members of the City Council Education Committee, for the opportunity to provide testimony on charter schools today. Class Size Matters is a citywide advocacy and research organization, devoted to providing information on the benefits of class size reduction and equitable conditions across all NYC public schools. In their attempt to justify expansion and take more space and resources from our public schools, the charter school lobby has repeatedly put forward six myths, which I shall show to be untrue. 1. 1. Charter schools are public schools. A charter school shall be exempt from all other state and local laws, rules, regulations or policies governing public or private schools, boards of education [and], school districts AND POLITICAL SUBDIVISIONS, including those relating to school personnel and students, except as specifically provided in the school's charter or in this article. · They can set academic, behavior and cultural standards that promote exclusion of students via attrition. Charter schools have also used their private status to evade federal constitutional and statutory protections for employees and students. 2. 2. Charter schools educate the same exact kind of students as public schools. Yet according to the publicly available statistics gathered by the DOE for their in 2012-2013 school report cards, PS 149 has nearly double the number of special needs students compared to Success Academy 1: 20.6% compared to 12.6%, and more than four times the number of English Language learners --18.9% compared to only 4.1% at Success Academy. In addition, according to DOE’s “Economic Need Index” which is a formula that includes the percent of free lunch students, in conjunction with the number who are homeless and/or on public assistance, the economic need of students at PS 149 is sky high, at 0.98, compared to the much lower figure of 0.69 at Success Academy 1. At P811, also located in the building, 100 percent of students are severely disabled, though figures related to their economic need or English language learner status are unavailable. The disparity in high needs students is found citywide at charter schools. The NYC Charter Center has admitted that charters enroll fewer students with disabilities and English Language Learners than the districts in which they are located. Bruce Baker at Rutgers has reported that there are significantly fewer free lunch students at NYC charter schools as well. 3. 3. Charters receive less public funding than district schools. This is untrue, at least as regards NYC charter schools. As the NYC Independent Budget Office pointed out in 2011, the two thirds of NYC charters that are co-located receive MORE per pupil public funding than public schools when their free space and services is taken into account. Yet the IBO analysis actually underestimated the inequities in public funding for charters vs. public schools, as it did not include the fact that while NYC public school budgets are tied to student need through the “fair student funding” formula – including the number of children in poverty, with disabilities and/or English language learners -- the charter school aid formula is not. This means as charters enroll fewer of these students, their public funding is even more unfair. Given their lower percentage of high needs students, NYC charter schools should receive approximately $2,500 less in per pupil aid, but in fact receive more. Charter students are also twice as likely to receive free busing paid for by the DOE, another factor that was left out of this IBO analysis. The large disparity in public support will grow even greater with the boost in per student charter funding in the new state budget, and the guarantee of free space for all new and expanding charters moving forward, which has sparked a “gold rush” for companies applying for the 73 new charter slots going forward, as yesterday’s Daily News pointed out. Not only will any of these schools be guaranteed free space at city expense, but any of the existing nearly 200 charters that are allowed by the state to expand to new grade levels will by law receive space paid for by the city as well. Of course these inequities do not begin to touch on the even larger disparity in private funding. Studies show that many of the NYC charter chains receive substantially more than similar district schools in privately raised funds, up to $4000 per pupil or more. The Success Academy chain is estimated to have a surplus of at least $30 million, and two weeks ago raised $7.75 million in just one night. 4. 4. Charter schools get higher test scores because of the superior quality of education they provide. Whether or not they achieve superior results, and there is much dispute about this, it may be due to charters’ increased funding, the socio-economic and demographic background of their students, and/or their much higher suspension and attrition rates. Probably all these factors contribute. Of course, the more a school pushes out struggling students, the higher their test scores will likely be. Suspensions were especially high among special education students, and according to Nelson Mar, an attorney from Legal Aid, at least one of these suspensions “was an illegal act of exclusion without any due process.”  Meanwhile, expulsion rates at NYC charters are not reported by charters to the city or the state; while at NYC public schools, expulsions are not allowed until a student turns 17. Nevertheless, the Charter Institute recommended without reservations that these three Success charters, as well as the entire network, be reauthorized for another five years, and has encouraged the network to replicate and expand at a faster rate than any other charter chain. According to the 2010 Amendments to the Charter Schools Act , when the charter authorizers renew or allow charter schools to expand, these schools were obligated to show they are meeting or exceeding enrollment and retention targets of students with disabilities, English language learners and free and/or reduced price lunch. And yet despite the lower numbers of high needs students at nearly all charter schools, and strong evidence that of higher attrition especially among special needs students, “There has not been a Regents, SUNY or DOE authorized school refused renewal or expansion due to enrollment and retention targets not being met,” according to Megan McCarville of the NYSED charter office. 5. 5. The charter schools have huge waiting lists, showing there is more parental demand for charters than public schools. The charters often trumpet their waiting lists in their political push for expansion. However, these waiting lists and application figures are not independently audited by any state or independent agency, as pointed out by a just-released study from the National Education Policy Center and should be eyed with skepticism as a measure of true demand. According to NEPC researchers, other reasons for this skepticism are that students often apply to multiple charters, and are thus double or triple counted on waiting lists; and in a recent national study, researchers could find only 36 out of 500 charter middle schools with sufficient large number of applicants to hold a lottery. At the same time, there are also waiting lists for many NYC public schools, if less publicized, and great demand, though DOE often tries to minimize those figures. It was recently revealed that there are 950 applications for just one hundred ninth-grade seats at Frederick Douglass Academy II -- an acceptance rate half of Success Academy’s claimed rate of 20 percent --despite the fact that a Success charter is being allowed to expand into their shared building and take three more of FDA II's rooms next year, including the school's only art room. According to the DOE, more than 7,000 NYC families received none of their top choices of public schools (up to ten) for Kindergarten next year, though the methodology for creating the waiting lists is still unclear and for the first time, DOE officials have refused to release complete figures for the number of zoned waiting list Kindergarten students at each individual public school. The DOE has also consistently refused to release any figures for unzoned students, and/or waiting lists for unzoned public schools, though we have asked for this data, as has reporters and Community Education Councils members. For some reason, even as the charters use their waiting lists for political advantage, the DOE too often tries to hide theirs. 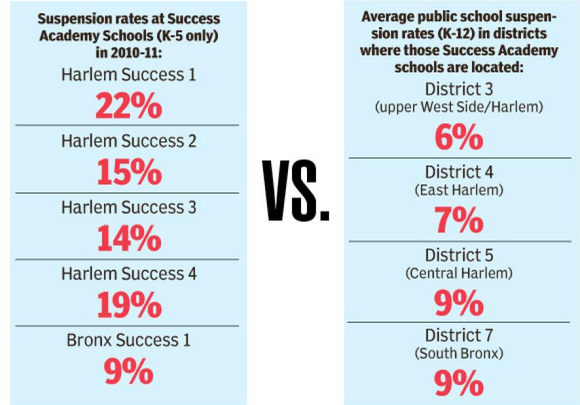 As an example of unmet demand that exists for public schools, in 2010, we did an analysis of the acceptance rates of the NYC high schools that DOE had put on its closing list that year. We found that many of the schools that were supposedly “failing” had acceptance rates far lower than Success Academy’s rate of 20 percent. For example, the Monroe Academy for Business and Law in the Bronx had an acceptance rate of only 8 percent, comparable to that of Harvard. The Academy of Environmental Sciences had an acceptance rate of 9 percent, comparable to Yale. Frederic Douglas Academy III had an acceptance rate of 11 percent, similar to that of MIT. Of course the acceptance rates of the highest performing NYC high schools are even smaller. For example, in 2012, Millennium HS in Lower Manhattan had an acceptance rate of only 3 percent, with more than 5,000 students applying for 150 seats. Similarly, the overcrowded Baruch HS had 7,606 applications for 120 seats, giving it an acceptance rate of about 1.6 percent. If parents were encouraged to apply to popular elementary schools outside their zones, and DOE made public their acceptance rates, these would likely far outshine those of any charter. Instead, under the Bloomberg administration, most of our elementary schools are so overcrowded that few intra-district transfers are allowed any more. All this overcrowding, of course, plays into the hands of the charter lobby, since parents in many districts apply to charters as well as public schools, just to be assured that their child will get a seat in any school nearby the next year. 6. The new state law which guarantees free space paid for by city taxpayers for all new and expanded charters going forward, will merely afford charter “protections” so they are treated like public schools. These provisions are not protections, but actually provide unprecedented privileges to charters, as there are overcrowded communities in NYC that have waited twenty years for a new school to be built in their neighborhoods, but now any charter that wants to open up shop in a district and is authorized by the state will now be guaranteed space free of charge. What is especially shocking is that the State Legislature and the Governor approved this law without any sort of fiscal impact or estimate of its cost to the city. After the city pays out $40 million annually in charter rent, the state is supposed to pick up a share of the cost; yet for any public school currently, the state pays half of any leases. Thus, it appears that the while obligating the city to cover the cost of any new or expanding charter, the state is willing to contribute less of the burden than it is for public schools. With more than 70 new charters allowed under the cap, and any existing charter of nearly 200 that now decides it wants to expand to new grade levels with the right to demand that the city provide them free space, this law will likely cost the city hundreds of millions of dollars per year, in an unprecedented corporate giveaway to private interests and the wealthy lobbyists and hedge funders who have contributed millions of dollars to the Governor’s campaign. Moreover, this new law, which is the most generous in the nation in terms of obligating district to pay for charter schools free space, applies to only New York City, where we have the most overcrowded schools in the state, the most expensive real estate, and the most underfunded capital plan. While hundreds of thousands of NYC public school children continue to sit in overcrowded classrooms, and in trailers, and on Kindergarten waiting lists, the charter schools will get a free ride at the city’s expense. It is truly a “gold rush” for private interests, as the Daily News describes it, and is likely to create vastly more inequities and disparities in future years, and further exacerbate a dual system of separate and unequal schools. Preston C. Green III, Bruce Baker, Joseph Oluwole, “Having it Both Ways: How Charter Schools Try to Obtain Funding of Public Schools and the Autonomy of Private Schools, “ Emory Law Journal, Vol. 63, No. 2, 2014, February 22, 2014. New York City Department of Education, 2012-2013 Progress Report for Elementary/Middle Schools, December 19, 2013, http://schools.nyc.gov/NR/rdonlyres/1550033E-3F15-4746-BD1A-DF3364721785/0/2012_2013_EMS_PR_Results_2013_12_19.xlsx. New York City Department of Education, Educator Guide, New York City Progress Reports Elementary/Middle/K-8 2012-13, http://schools.nyc.gov/NR/rdonlyres/7B6EEB8B-D0E8-432B-9BF6-3E374958EA70/0/EducatorGuide_EMS_20131118.pdf. New York City Independent Budget Office, “Charter Schools Housed in the City’s School Buildings Get More Public Funding than Traditional Public Schools,” February 15, 2011, http://ibo.nyc.ny.us/cgi-park/?p=272. Juan Gonzalez, “Mayor Bloomberg should stop blaming bus workers for the strike and look for creative solutions,” Daily News, January 17, 2013. About 20% of charter school students receive busing paid for by the city, compared to 9% of public school students. Ben Chapman, “New state law changes makes opening charter schools in New York City easier than any other in nation,” Daily News, May 5, 2014. Mercedes Schneider, “Success Academy Tax Documents: Moskowitz Can Afford the Rent,” deutsch29, December 1, 2013; http://deutsch29.wordpress.com/2013/12/01/success-academy-tax-documents-moskowitz-can-afford-the-rent/; Eliza Shapiro, “Unions blast Bush-headlined charter fund-raiser,” Capital NY, Apr. 30, 2014. Gary Rubinstein, “How to Define Success?” TeachforUs.org, August 13, 2013, http://garyrubinstein.teachforus.org/2013/08/13/how-to-define-success/; New York State Education Department, 2011-2012 New York State Report Card for Success Academy Charter School, https://reportcards.nysed.gov/files/2011-12/RC-2012-310300860897.pdf, and New York State Education Department, 2011-2012 New York State Report Card for PS 149 Sojourner Truth, https://reportcards.nysed.gov/files/2011-12/RC-2012-310300010149.pdf. Juan Gonzalez, “Success Academy school chain comes under fire as parents fight 'zero tolerance' disciplinary policy,” Daily News, August 28, 2013. Charter Schools Institute, State University of New York, “Renewal Recommendation Report, Success Academy Charter School - Harlem 3,” February 11, 2013; http://www.newyorkcharters.org/documents/SAHarlem3RenewalReportFINAL.docx. The same phrases and recommendations were issued for Harlem 2 and Harlem 4 Success charters at the same time; see http://www.newyorkcharters.org/documents/SAHarlem2RenewalReportFINAL.docx and http://www.newyorkcharters.org/documents/SAHarlem4RenewalReportFINAL.docx. These requirements are in Section 2851(4)(e) related to charter renewal applications, and in Section 2852(9-a)(b)(i) related to applications for new charters under RFPs issued by the Board of Regents and the SUNY Board of Trustees. Section 2852(9-a)(b)(i) requires that the Board of Regents and the SUNY Board of Trustees prescribe enrollment and retention targets. All charter schools that were initially chartered after August 2010 or renewed after January 1, 2011 are expected to meet or exceed the enrollment and retention targets for each individual school. Megan McCarville, NY State Education Department, email to Leonie Haimson, dated April 29, 2014. Kevin G. Welner and Gary Miron, “Wait, Wait. Don’t Mislead Me! Nine Reasons To Be Skeptical About Charter Waitlist Numbers,” National Education Policy Center, May 2014, http://nepc.colorado.edu/files/nepc-policymemo_waitlists.pdf. Juan Gonzalez, “Eva Moskowitz’s Success Academy Schools network rolling in money but still wants 50% increase in management fees from state,” New York Daily News, June 25, 2012, http://www.nydailynews.com/new-york/eva-moskowitz-success-academy-charter-schools-disproportionate-share-state-education-money-article-1.1101668. Pamela Wheaton, “Long kindergarten waitlists persist at 5 schools,” InsideSchools.org, April 23, 2014, http://insideschools.org/blog/item/1000826-long-kindergarten-waitlists-persist-at-some-schools. Leonie Haimson, “Acceptance rate at proposed closing schools,”, New York City Public School Parents Blog, January 26, 2010; http://nycpublicschoolparents.blogspot.com/2010/01/acceptance-rate-at-proposed-closing.html. InsideSchools, Profile for Millennium High School, http://insideschools.org/high/browse/school/69. Liz Robbins, “Lost in the School Choice Maze,” The New York Times, May 6, 2011. Jessica Bakeman, “Cuomo to be ‘honorary chair’ of pro-charter retreat,” Capital NY, Apr. 15, 2014. Thank you Leonie! You're a wonderful spokesperson for public school parents and students. Just Brilliant! I also want to thank you. Incredibly well written and documented and devastatingly persuasive--should any of the powers-that-be actually read it. Excellent testimony. Very impt to constantly expose and repeat lies of the private charters posing as public schools to grab money and free space from our kids. Very well stated, Leonie! Thanks so much for such a comprehensive report! Hopefully, these politicians will realize that their own jobs are on the line if they support this favoritism towards privately managed, unaccountable charter schools, while neglecting the majority of students, many of whom are in under-resourced genuine public schools. A couple points about Success Academy: While kids in neighborhood public schools languish in over crowded classes with high student-teacher ratios, the additional funds have enabled charters like Success Academy to hire two teachers for each classroom, lowering their student-teacher ratios considerably. Also, parents have reported that the online application for Success Academy allows for the child to be put on lists for all of the Success Academies at the same time, and they count each application separately, so their waiting lists are greatly inflated. (And who would waste so much money on advertising when they have waiting lists?) Plus, the application process takes 3 minutes online and applicants don't have to prove they have a child. Thanks for posting this. Parents need to learn the danger of "corporate charter schools". They may seem like a better alternative now, but that is only because there are still other options out there. As soon as those option disappear, charter school will be staffed with a minimum wage, uncertified staff in order to keep as much of the schools budget as profit. It's a bad situation, and people really need to wake up. Excellent analysis. It's hard to argue with this. Charter schools are very crowded schools in New York. If you want your child to study in these schools you should wait because thousands of parents are in row to get their child admitted to these schools. If you have a disabled child then I advise you to admit your child in a private special education school that has a good reputation.